President Reagan introduces Judge Anthony Kennedy (second from left) and the members of his family after nominating him to the Supreme Court. Congress isn’t the only branch of government that could go through a shake-up in 2018. For the second year in a row, rumors are circulating that Supreme Court Justice Anthony Kennedy, who is 81 years old and wrapping up his 30th year on the high court, is poised to retire when the term recesses in June. Politically, the stakes couldn’t be higher. For several years, Kennedy has been one of the court’s most powerful justices thanks to his role as a pivotal swing vote, delivering victories to both the left and right in contentious cases. If Kennedy retires this year, President Trump and the Republican-controlled Senate will almost certainly replace him with a right-wing justice who is likely to secure a conservative majority on the court for years to come. But if Kennedy stays on the bench and Democrats assume control of the Senate in January, the promise of a solidly conservative successor for Kennedy seems more uncertain. It’s challenging to predict when any justice will retire because they’re balancing a number of hard-to-measure factors, including the political environment, whether they feel they’ve built a legacy, and questions about their own health. Kennedy, though, is in a particularly difficult position because he holds an unusual amount of power on the current court, and he has good reason to be concerned that a Trump-appointed successor might undermine key parts of his judicial legacy. Kennedy, a centrist conservative, was appointed by President Ronald Reagan. He’s the second-oldest justice on the bench after liberal Ruth Bader Ginsburg, so it seems safe to assume that he has at least contemplated the idea of retirement while the GOP controls the White House. But while several experts on judicial behavior believe that justices weigh the political climate when considering whether to step down, these considerations can be more complicated than they appear — especially for a justice like Kennedy who appears to be substantially more moderate than the current president. Indeed, the political climate can’t be reduced to the political party of the sitting president: It includes the ideological makeup of the rest of the court, how liberal or conservative the president is relative to the retiring justice, and the composition of the Senate. 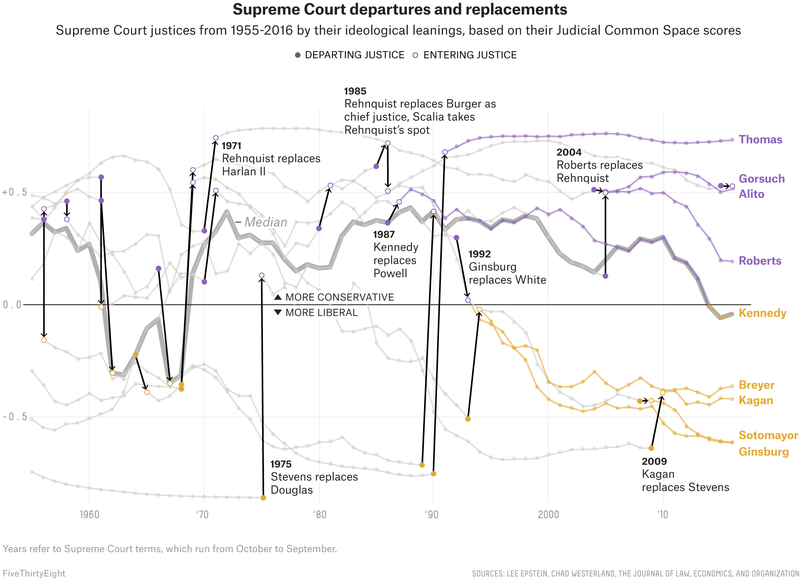 Kennedy’s influence on the court, combined with his ideological distance from the current president and the Senate, help explain why even if Kennedy cares deeply about the political ramifications of his departure, he still might choose not to retire this year — and why it’s so difficult to predict when Supreme Court justices will leave. Are there signs that Kennedy is planning to retire? The most obvious sign that a justice is planning to retire is that they don’t hire a full slate of law clerks for the upcoming term — but if they do hire a full complement of clerks, that doesn’t necessarily signal anything about their intentions. Kennedy lined up his contingent of clerks late last year, but it’s common for other justices to take on clerks if the judge who hired them departs unexpectedly. There’s also some reason to believe that Kennedy would want to refrain from retiring this year since justices typically avoid leaving during an election in an effort to prevent the politicization of the vacant Supreme Court seat. This convention may apply more to presidential election cycles than congressional midterms, though. Others might watch this year’s decisions closely to see if Kennedy appears to be burnishing his legacy on crucial issues. But it’s a highly speculative endeavor, especially since Kennedy — as the court’s swing vote — has authored a number of high-profile rulings over the past few years and did not follow them up by retiring. When is it politically opportune to go? There are several possible reasons why Supreme Court justices might assess the political climate when they’re deciding to retire. 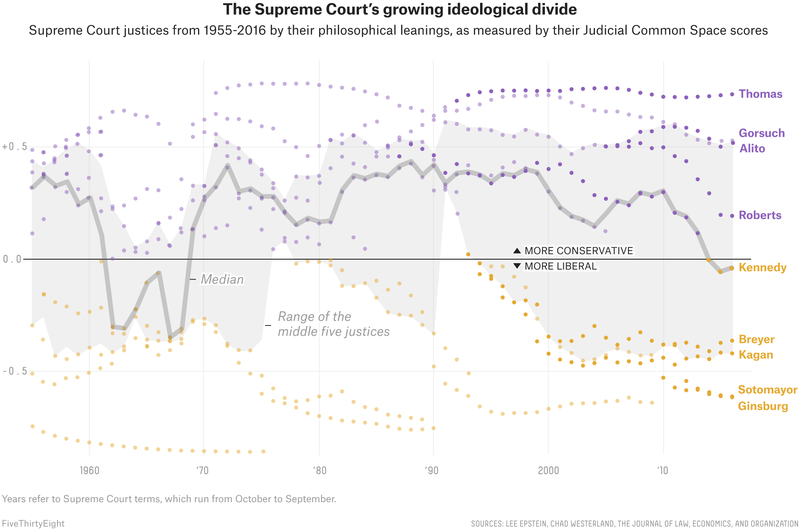 The first is simply that justices have partisan leanings like everyone else, and they would prefer to see their seat filled by someone of a similar ideological persuasion. There is some evidence that justices are more likely to retire under presidents of similar partisan stripes, but that doesn’t necessarily mean retiring under a president of the same party as the one by whom they were appointed. For example, two justices saw an opportune political moment to retire when Democratic President Barack Obama took office: David Souter, who retired in 2009, and John Paul Stevens, who retired in 2010. Both were appointed by Republicans, but they shifted leftward during their years on the bench while the GOP shifted to the right, which meant they were solidly part of the court’s liberal wing by the time they departed under Obama and a Democrat-controlled Senate. Developed by a group of political scientists including lead researcher Lee Epstein, at Washington University in St. Louis, and Chad Westerland, at the University of Arizona, the scores provide a snapshot of where each justice fell on the court’s ideological spectrum in his or her last term, and show how the incoming justice shook up the court’s ideological rankings. Some were replaced by relatively like-minded successors. But others were replaced by highly dissimilar justices — including some successors who even went on to undermine the departing justice’s legacy. Ginsburg similarly refused to retire under Obama because she didn’t believe he’d be able to appoint a sufficiently liberal successor — and she is now grimly hanging on to her seat in her mid-80s to avoid departing under a Republican president she openly dislikes. And even when a justice retires under seemingly ideal political circumstances, they still may not get an ideologically similar replacement. Sandra Day O’Connor — a Republican whose husband reportedly expressed horror at the prospect of an Al Gore presidency because she wanted to retire under a Republican — was ultimately able to step down under a fellow Republican, President George W. Bush. But she has subsequently criticized her replacement, Samuel Alito, for being too conservative. O’Connor’s regrets about her departure may be instructive for Kennedy, who replaced her as the court’s swing vote. Kennedy is currently the only true moderate on a court that has seen widening ideological polarization over the past few years. Will it come down to party loyalty? The question, then, may simply be whether Kennedy is enough of a party loyalist to give up his exceptionally influential role and allow his seat to be filled by a justice who will almost certainly be more conservative than him. This is clearly the path that GOP politicians are hoping for. And he wouldn’t be the first justice to bow to the forces of partisan politics. Byron White was appointed by John F. Kennedy, a Democrat, and chose to retire under another Democrat, Bill Clinton, despite having drifted away from the party on key issues like abortion. But at the time of his departure, White was not one of the court’s most decisive votes, so the fact that he was ultimately replaced by the even more liberal Ginsburg didn’t have a dramatic impact on the court’s ideological makeup. Kennedy, on the other hand, has to grapple with the knowledge that his departure will almost certainly change the court for years or even decades to come. That means that he may be weighing the political climate differently than would justices who are more aligned with today’s Democratic or Republican party. These comparisons should only be made for justices who retired in the 1950s or later. Today’s justices serve much longer than their predecessors, thanks both to longer average lifespans and a general desire, according to experts, to stay on the court for as long as possible. And a pension package passed in 1954 gave justices a new flexibility to time their departure based on personal or political factors. Earlier justices often stayed on the court until their health failed or they died on the bench, likely in part because they didn’t yet meet the requirements to qualify for a full pension, according to Artemus Ward, a political science professor at Northern Illinois University and an expert on Supreme Court retirements. To calculate the scores, the researchers use measures of judicial ideology based on justices’ votes on cases. The scores are re-scaled to be in the same dimensional space as DW-Nominate scores and range from -1 to 1. These scores show how justices vote in relation to each other, with higher numbers indicating more conservative leanings. Updated Judicial Common Space scores through the 2016 term were provided by Chad Westerland.